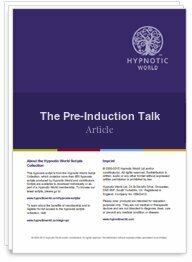 As a hypnotherapist, your Pre-Induction Talk (PIT) is probably the most important part of your initial session with a client. By being able to put your clients at ease and answer any questions they may have you will instil confidence and a more secure belief system. New Hypnotherapists are often unsure as to how to deliver this PIT and the following script gives you an outline of what we would generally say to our clients before the session begins. Download this Pre-Induction Talk script today to get off on the right footing with your new clients.